Everlasting Moving is a professional and certified moving services company and holds specialization in offering full-fledged long distance moving services to the customers to make their move a simple and hassle-free process. The company is determined in making your long-distance relocation an easier process for you, all you have to do is to just book your flights, take a plane and their experts will take care of all the moving-related issues. All of their movers are highly qualified and trained professionals who know how to perform all the tasks to make your move a good and worthy experience for you all. They will pack, unpack, load and unload all your belongings carefully during the relocation, making sure that none of them gets damaged during the way. Along with this the company also supply various necessary packaging material that includes, customized wooden crates, bubble wraps, moving blankets and custom box bundles, making your packing go easy and simple. They will also provide you with auto transport services to make you long- distance relocation much easier. This utmost good and cost worthy services have made the company list itself under the topmost moving companies of the town. Call them any time to visit their website to book free in-home estimate services. Everlasting Moving was established in 2010. 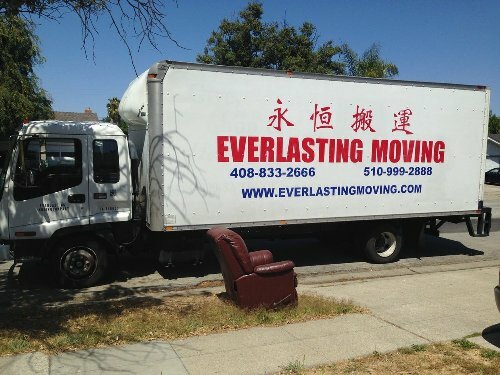 Everlasting Moving is a local and long distance moving company.The company of "professional services, safe and efficient, reasonable profits, the customer first" business philosophy and "to maximize the value of creating value for customers" as its mission, they have the most responsible porters. And the quality of moving good, have received professional training, regular acceptance of labour safety education, and strong demand for staff to maintain self-image personal image. Uphold the supremacy of customer service quality assurance of the decentralized business philosophy, to provide the best quality service relocation. 895 E Fremont Ave, Sunnyvale.